An extremely unique, often touching and unrepentantly odd film, the hour-long BBC documentary Nina Conti: Her Master’s Voice is about several things: among them are the grieving process, “the line between creativity and insanity,” and a ventriloquist convention held annually in Kentucky. The film was made by its star, English ventriloquist Nina Conti (daughter of actor Tom Conti), as a gesture of thanks and mourning for her acting teacher and ex-lover Ken Campbell, who died in 2008. In the film’s opening scenes Conti speaks quite candidly about how Campbell changed the course of her life by urging her to focus and sharpen her acting skills with ventriloquism. The result has been a flourishing career for her on the British comedy scene. Campbell’s final gifts to her were his own ventriloquist dummies (including a puppet head of himself). Upon receiving them, Conti undertakes a journey to the “Vent Haven ConVENTion” to honor his memory and to lay the puppets to “rest” in the strange (and extremely American) puppet museum/“rest home” Vent Haven. Conti serves as the protagonist in the docu; the antagonist is her ever-present puppet friend “Monkey,” who she serves as the foil for in her delightfully reflexive (and quite brilliant) standup. Her act, which is present as an extra on this disc and is sampled in the docu, wonderfully toys with the notion that ventriloquism is a socially approved form of schizophrenia and a great way to play with audience expectations. So Her Master’s Voice works on several different levels at once. Perhaps the most easily recognizable one to viewers on these shores is the “American oddball” aspect (best exemplified now and forever by Errol Morris’s Gates of Heaven). 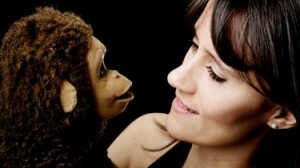 However, Conti is one of the oddballs herself, so her view of the ventriloquists and the convention is extremely fraternal and sympatico — and also clinical, as when we meet a ventriloquist who operates Monkey more adroitly than Nina does, and another whose specialty is throwing his voice literally anywhere (thus not necessitating a dummy). The docu thus moves from being a compassionate look at a kooky performance subculture — far, far removed from the Vegas-y excesses of Jeff Dunham and Terry Fator — to Conti’s reckoning with the memory of her mentor. The fact that she’s able to balance the pain of loss and the evident silliness of creating voices and characters to go with Campbell’s dummies is an impressive achievement. Performance as therapy? You bet.